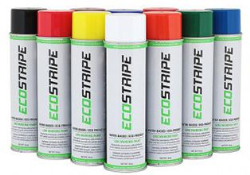 EcoStripe™ water-based aerosol paint. case of 12-18 oz aerosol cans. Formulated and manufactured by USSC, this eco-friendly proprietary water-based formula is available in 16 vibrant colors. ECO-STRIPE marking paint is easy to spray, environmentally safe, non-clogging and will not hurt, turn brown or kill any type of natural grass. Aerosol cans will spray sharp, bright lines that will maintain good visibility. It's performance and quality is above any other water-based marking paint in its category. If a more durable paint is needed we offer our DuraStripe formulation. Our universal " T " tip fits most machines and will spray a 2 to 4 inch wide adjustable line. ECO-STRIPE is also available in narrow spray pattern, cylindrical " UMA " tips. Use with striping machines or Spray Wand. Coverage up to 250 feet per can.